A woman walks with orphans at an Addis Ababa orphanage in 2013. The number of Ethiopian children adopted by Americans fell from 2,511 in 2010 to 133 in 2016, according to the State Department. Ethiopia's parliament banned all foreign adoption in January. The Huelsman family — Brad and Niki with 3-year-old Girma and 6-year-old Isabela Kalkidan — arrived back in Ohio from Ethiopia in January. The couple may be among the last Americans to adopt a child from Ethiopia. Now, they have Girma in their arms. 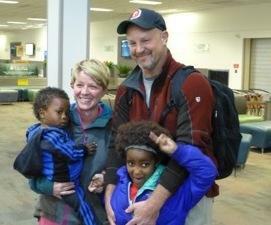 But this couple may be among the last Americans to adopt a child from Ethiopia. 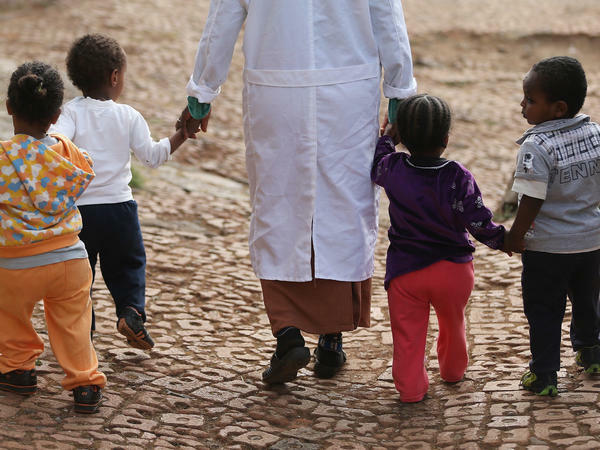 Back in January, the country's parliament banned foreign adoptions, citing concerns about the safety of Ethiopian children. The ban was in part triggered by high-profile cases of abuse, including one in 2011 where an adopted Ethiopian child in Seattle died of hypothermia after she was left outside in the cold. At the time, Ethiopia was second only to China as the most popular country for adoptions by Americans. Since then, the U.S. and Ethiopia made adoption requirements more stringent and the number of Ethiopian children adopted by Americans plummeted from 2,511 in 2010 to 133 in 2016, according to the State Department. Now it's not possible at all. The parliament said Ethiopia should take care of its own children. Lawmakers worried that Ethiopian children taken abroad could suffer identity crises and psychological problems, in addition to physical abuse. The Huelsmans' older child, Isabela Kalkidan, was also adopted from Ethiopia. They favor stringent vetting. To adopt Girma, for example, they went through multiple rounds of home visits and background checks. They say they want Girma and his 6-year-old sister to learn about their Ethiopian heritage. "I want to believe that Ethiopia finds a way to support their kids and keep their kids in-country, but also becomes open to the fact that a family is a family," Niki said. "Whether they are in the U.S. or they are in Dubai or they're in Nicaragua, or they are anywhere, a family is a family." "Even if we are poor, it's better to be with our society"
The sprawling compound of the Kechene Children's Home is up in the hills of Ethiopia's capital Addis Ababa. The orphanage, which is funded and run by the Ethiopian government, is a collection of brick buildings nestled between towering pine trees. It houses about 195 girls, ages 7 to 18. Welay Seha, the director, says they can take 200 more. "We have the capacity, because this institution is under government," Seha says. "There is not shortage of budget here." Seha walks from the library to one of the residences. It's old but tidy. The wooden floors are splintering and some of the doors don't work. During the day, the girls go to the closest public school and some of them, he says, will go on to college. Seha is proud of the work they do here and the government wants to do much more. There are plans and a budget, he says, to remodel many of these buildings. As he leaves the residence, he walks past the kitchen, where a cook is stirring huge pots over a wood-burning stove. Then, he steps into a small building where the special-needs kids live. All the caretakers are in an office, so the children are left alone. Some of them are confined to a bed, but most of them are in a living room, eyes glued to a television set overhead. They are disheveled, unbathed, their hands clammy, their faces still dirty from breakfast. Ethiopia does not have a strong culture of adoption, so these kids will spend their whole lives here. When asked if he is sure that these children are better off here than in a family home in the United States, Seha nods approvingly. "We are sure enough, because our country is growing," he says. Parliament's policy change comes at a particularly nationalistic time in Ethiopia. The country is having political problems, but it is also resurgent. There is an economic boom and the country has begun asserting itself in geopolitical issues. Despite protests from Egypt, for example, Ethiopia is building a massive dam along the Blue Nile. Not only that, but it is being built entirely with Ethiopian money — bonds bought by regular Ethiopians who believe the dam will help the country regain its historical glory. The country is a former empire and fended off Western colonialists. Abebayehu Fikadu, an administrator at a private orphanage called Zewditu Meshesha Children and Family Welfare Development Association, says the new, restrictive adoption policy has a lot to do with Ethiopian pride. Ethiopian children, he says, should be brought up where they were born so they can help the country move forward. Whatever quality of life they might find in a place like the United States, he says, could never replace national pride. "Even if we are poor, it's better to be with our society," he says. "Nationality is not replaced by money." None of the private orphanages opposed to the government's new policy wanted to speak with NPR on the record. A Catholic nun who runs an orphanage but did not want her name used for fear of retribution from the government said she just hopes the new policy won't mean more children are left on the streets. The Huelsmans made it back to the United States in January with Girma in their arms. "This transition is about as good as it could have gone," Brad Huelsman said. Big sister is a little jealous, but Girma has learned to love the family dogs and has even adjusted to the cold. "Sometimes I look at him even now and think I can't believe he's home," Niki Huelsman said. But it's a shame, they say, that other American families won't know this joy.